Sighting of police vehicles yet again early on a Saturday morning did not bode well for the day's parkrun but the smiling police soon put runners at ease as they were there as part of 'Operation Sceptre', the ongoing national police response to knife crime. Lead by PCSO Louis De'Ath, a group of civilian volunteers and police personnel were to spend the day scouring the Common for any bladed weapons that may have been discarded and could be of danger to general public. 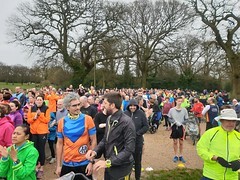 So once it was established that the Southampton parkrun would not be called off for the second time in a few months, Run Director for the day, Gillam MCCLURE, helped by signer Sarah WEBB, set the runners off across the flats in hot pursuit of lead cyclist Cy COLEMAN. The local running club Itchen Spitfires has, over the last few weeks, organised a 'Couch to 5K' running course with this week's parkrun as "Graduation Day". Congratulations to those first timers taking part in this. And for those who enjoyed the parkrun for a little longer, they had a fantastic greeting at the finish by their fellow graduates before a celebration in the Bellemoor Tavern. Among other first timers were Christine and Garry GLASS who have run in the past but thought they would give parkrun a go. Welcome Christine and Garry. Now that I am ageing and my finish time is gradually slowing I find the breath to talk to other runners on the way round and this week Joy GEDDES of Bitterne Park, who only started running this winter, came up alongside me and we helped each other to the finish. This spirit of help and cooperation is so important to our event. We regular parkrunners on the Common all know the face of perennial volunteer, Sue WILSON, who is ever present at Coronation Crossroads, or "Sue's Corner" as we have come to refer to it. This week Sue, who was celebrating her birthday was helped by Adam WILLIS and family. Adam was having a rest day prior to running the Fleet Half Marathon on Sunday and maybe one or two others were also resting as the Reading Half Marathon is on the same day. So, whenever I write the run report I always try and point out the importance of volunteering once or twice a year as without volunteers there would be no parkrun. Someone who does a bit more that once or twice a year is Paul TONGS who managed to have two celebrations on the same day, 250 runs and 200 volunteer occasions. Paul combines his running with volunteering by helping to set up the finishing funnels before crossing over to the start. After Paul has helped erect the funnel the tapes are taken over by a troop of funnel managers, among them were Paul LEEMING, Helen MALPUSS, JD NICHOLSON, Katherine BARBOUR and Vicky TOOMEY. Vicky feels that volunteering is essential 'because it would be unfair of taking advantage of other peoples kindness' if we did not all do our bit. Along with Paul TONGS were another 25 runners with over 250 runs to their name. We have ten more runners due to reach that magic figure over the next few weeks. Celebrating reaching the hundred mark today were Isaac BENNETT, Ian ROBINSON, Neil TOWNS and Emily STOODLEY while the 50 mark was reached by Chris SETTERS, Kat BERRY, Luke ATKINS, Steven CANN and Katherine HOPPE. Congratulations all. A good way to see the country and make new friends is to engage in parkrun tourism. We are fortunate to receive many visitors in Southampton. This week, visiting all the way from Essex were Danny, Jodie and Jodie's dad Frank. Clearly they were here just for the parkrun, but while they are in town they plan to visit The Mayflower Theatre to watch 'The Band', a new musical about the group 'Take That'. Frank's wife and Jodie's mum Marilyn gave all three runners support. Another runner from out of town was John PAICE of Manchester, studying for a PhD at Southampton University and soon off to India as part of that, may have misplanned his tourism as there are no parkruns there yet! When we have done a parkrun PB and crossed the line, a little out of breath, the last thing we want to hear is a pleasant voice saying, 'keep moving', but due to the many participants every week on the Common it is important for all of us to move swiftly along the funnel so as others, perhaps attaining their own PB, can cross a uncongested line. So spare a smile for the 'Funnel Managers' and perhaps in weeks to come you may volunteer for that very important job. While running the PB did you give any consideration about how safe the course is? This is due to the many volunteer marshals and to Gareth JONES who most Saturdays arises a little earlier that the rest of us to cycle the route looking for obstructions and putting out a few direction signs in case of a lack of marshals at any particular part of the course. 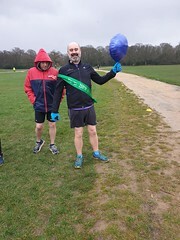 On a slightly damp but very windy Saturday morning, just short of 1800 runners, but more importantly many volunteers, rose from their beds to make the four local parkruns the great success they are. This week 1040 people ran, jogged and walked the course, of whom 86 were first timers and 120 recorded new Personal Bests. Representatives of 55 different clubs took part. Southampton parkrun started on 7th July 2012. Since then 21,615 participants have completed 211,494 parkruns covering a total distance of 1,057,470 km, including 35,944 new Personal Bests.